For about a 400 year time period before the kings began to reign in ancient Israel, God used a series of judges to guide the people. One of the latter serving judges, Samson, was unique in that God had blessed him with incredible, superhuman strength. Samson’s only requirement for keeping that strength was never to cut his hair. Funny, I know. Samson’s feats of strength were legendary. Unfortunately his desire for heathen women was equally renowned. And his undoing would come at the hands of a Philistine woman named Delilah. When the five lords of the Philistines learned that Samson had fallen in love with Delilah, they approached her with a proposition. Find out the secret of his strength and your reward will be 1,100 pieces of silver from each of us. That’s 5,500 pieces of silver to betray the one you love. Financially speaking, that would set her up quite nicely. I believe Delilah loved Samson because the Bible does not give us an indication otherwise. It does say in Judges 16:4 that Samson loved her so it’s reasonable to conclude she loved him back, at least for short time. Regardless, the financial proposal proved very enticing. The love of money became too powerful for Delilah to ignore. So she went to work, and with her feminine wiles in full action it didn’t take long. How could it when you live with a persistent and whiny woman who whips out guilt-producing lines like, “How can you say you love me if you won’t tell me your secret?” Samson had no chance when faced with this type of nagging day in and day out. So he told her. And while he slept one night she cut off his hair. God’s strength left Samson, the Philistine lords captured him and Delilah received her reward. She opted for money over love. I have a simple takeaway from this story: money is a powerful motivator. It can disrupt us, make us rationalize decisions and lead us to compromise values. We are fooling ourselves if we don’t believe that. And, in our denial, we may just be setting ourselves up to follow the route of Delilah. Questions: Do you believe your morals/beliefs are strong enough to control money’s power and influence in your life? What’s the closest you’ve come to compromising your standards for money? Would you ever take money over love? Wow. That was a brave post. I believe that I would not compromise my loved ones for money. Money and love can be very tricky. When I say, “No” to my kids, some might say I’m putting money above love, but my motivation is to give them a sense of financial reality before they’re on their own. 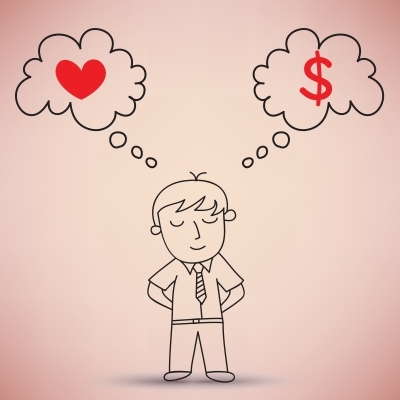 When I hug my husband for having a profitable day in business, am I loving him for his money? I don’t think so. I think I’m feeling his encouragement and looking forward to a solid debt repayment to make our finances more solid. I believe (and hope) I’m on the right side of that line in the sand. Good food for thought! Funny, I think about this a lot as we work to become more self-sufficient. I completely agree that my conscience would not allow me to act too terribly immorally, but then when you mentioned Hurricane Katrina, we’ll that one always gets me thinking. I feel blessed that we’ve been given the wisdom to think and plan ahead for cases like this, but I’d steal to feed my kids in a New York Minute if I had no other options. I guess that’s what you meant by “extreme circumstances”, but I do get nervous when thinking about how far I’d go for money when it comes to keeping the kids fed, safe and warm. Interesting subject, Brian! Good point Laurie. The discussion reaches a whole new level when you throw kids into the mix. I was at a conference where the speaker talked about the “Fraud Triangle” — pressure, opportunity, and rationalization. When these three things are present, the chances go way up for even someone who has never done anything illegal or unethical before to start stealing from his or her employer. Some of the stories were surprising — it always started just a little and then it snowballed. I can see those three points being the driving force behind unethical behavior. And I think you are right…it always starts out as something small. Well I’d really like to think I’d never do anything illegal or something that REALY compromised my morals. But I think there is a lot of low-grade compromising going on. For instance I worked at a video game company for eight years, and I never really believed in ALL video games. Some I liked and thought were educational and fun. Like I love Just Dance. But I hated the gory killing games. Well I didn’t get a choice what I worked on. And oddly enough Im a movie buff and it doesn’t really bother me there. Anyway, I think we all sell ourselves down the river just a little tiny bit in our lives. I think we just do the best we can. But then you have instances like when the earthquake happened in Haiti and people were killing other people for food/water/shelter. I hope to never be in a situation where it came down to that. How awful. We LOVE Just Dance 🙂 I completely horrified my older daughter when we were out in public and “You Don’t Know You’re Beautiful” came on and me and the two little ones started doing the Just Dance routine to it…lol. Or to hit a bit closer to home…what happened after Hurricane Katrina. There were some who took advantage of the situation. I know those are extreme circumstances to be in but some clearly stole merchandise from stores because there was no one there to stop them. It’s just tough to really know where our tipping point is and what might actually drive us to rationalize our actions. I think there’s a reason why the Bible says “the love of money is the root of all evil.” The sheer number of immoral things done every single day, week, year, etc. for financial gain is overwhelming to think about. I don’t believe money itself is evil, as it is essentially just a store of value and represents value created (which is a good thing! ), desiring it to the point where you are willing to compromise and even do harm to others is where the sin really comes in. Great perspective DC! I think you are right on…money itself is not the issue. It’s amoral. When put in the hands of people is when it becomes challenging. While I agree that money is a powerful motivator, I would never hurt the ones I love to become rich. I’d rather make my money in a way I am comfortable with, which means legally! Money and power can breed greed in the wrong hearts unfortunately, but I like to think I would stay the moral course. Otherwise, I would think that my riches or influence were tainted, and I don’t think I could ignore that enough to enjoy it. I’m with you E.M. My conscious would not allow me to hurt the one’s I love.